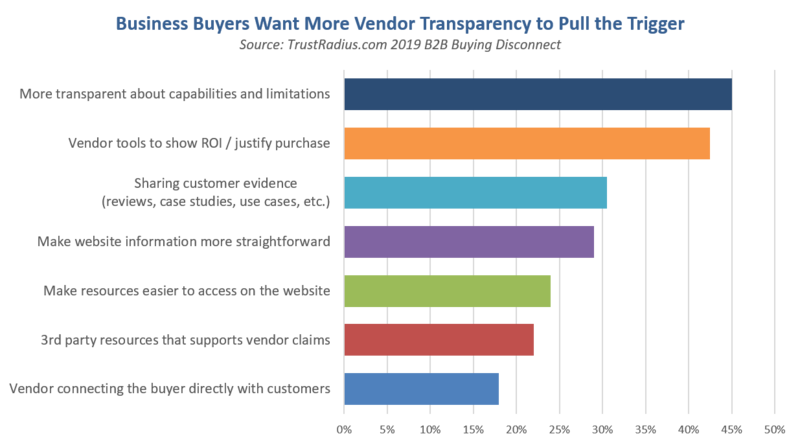 More than half of business buyers postpone buying decisions because Vendor website copy isn’t making the case persuasively. 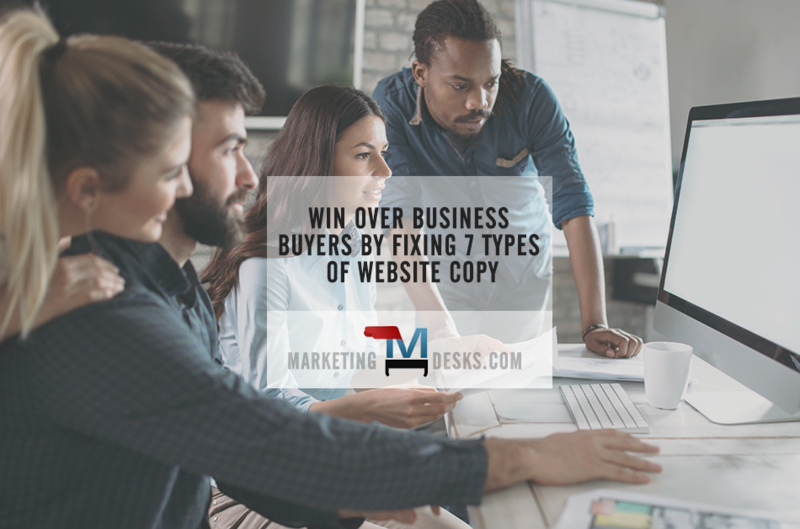 Fix these seven types of website copy to make B2B business buyers more likely to pull the trigger. More transparency in your website copy may be the answer. You might also like: What Do SEO Content Writers Do? The “and” here is salient. Business buyers don’t want you to stop at features and benefits when describing your products or services in website content. They also want to know what the limitations are, what the product or service can’t do. Capabilities and limitations are all about buyer expectations! Realistically, what will it provide to or enable your customer with? What features are buyers commonly or sometimes looking for in a product like yours that your offering does not fulfill? Overpromising through vague website content descriptions can feel like lying by omission to the customer who is disappointed when their needs aren’t fully met. Showing limitations can also be an outstanding way to upsell clients to a more robust solution or cross-sell to a more appropriate one. 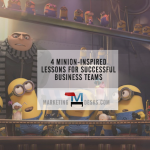 Talking about shortcomings thus becomes an effective and positive B2B marketing tactic. 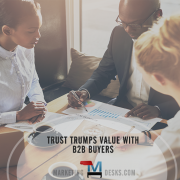 Sometimes the business buyer is the decision-maker; however, in many cases, they are researching options, narrowing down choices and then making the pitch to someone higher up who holds the purse strings. Minus the ability to demonstrate tangible ROI (return on investment), the researcher may not have enough evidence to persuade the individual or committee making the final decision. 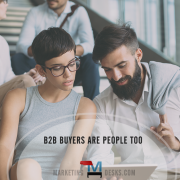 Many business sellers don’t include pricing information on their website as a B2B marketing tactic designed to weed out cold leads and/or present sales people with lead lists. 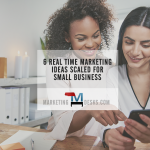 But if your website content isn’t offering prospects an idea about what type of investment and return on that investment they might achieve, your business might not ever make the short-list when they decide the time is right to talk to a brand representative. Reviews and 5-star ratings are the new word of mouth. Sure, you can share testimonials; however, these are vetted. Having product reviews online inspire confidence as the site visitor’s perception is that this is a “real person” (just like them) who purchased and loved the product or service. 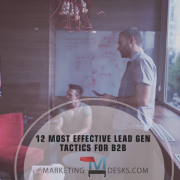 Additionally, this type of web content is closely related to that needed to demonstrate ROI above, as case studies and use cases give the business buyer an objective confirmation that what you say your products and services will do, they will – in fact – do. Expunge flower language, insider jargon and inadequate descriptions from your website content. Instead, think through every piece of product copy in terms of whether it answers the common questions business buyers ask. Don’t leave the next step in the buying process up to chance. Always, always, always tell the prospect what to do next. Always give the site visitor a “next step.” Explain the buying process and tell them what happens next. Not sure where your website copy is lacking? Just ASK! Your current clients, sales representatives and customer service staff can be a great source of learning when it comes to what is missing from your online content. Doing online product demos can also be a helpful way to show your product’s capabilities in a straightforward way. It gives the business buyer a look at the practical applications of your offering and demonstrates ease of setup and use. 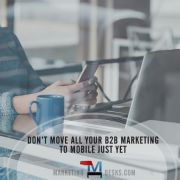 Moreover, doing these in video format makes them uber-practical as they can be shown in sales presentations, shared on social media and email, replayed at tradeshow events, etc. Does the average site visitor need a Google map assist just to find what they’re looking for on your website? The more website content you have, the more important it is to make navigation easy and organic. How many “clicks” does it take for the site visitor to get to the information they’re looking for? Does your website copy include lots of nested internal links, making it easy for a site visitor to find additional explanatory or instructional information? Is it easy for the site visitor to chat or talk to a real person if they get stuck? Is it easy to find the right place to get help? Examples of third-party verification include YouTube reviews, expert analysis, expert ratings, third party placements (such as a listicle including your products and/or services in “best of” articles). What could be more powerful than a satisfied customer-to-prospect interaction? 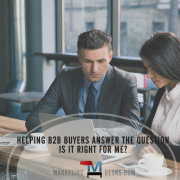 When business buyers can connect directly with customers, they can ask clarifying questions not only about your products or services, but about your customer care before, during and after the sale. 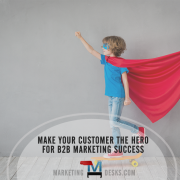 A customer testimonial in this format could be the deciding factor in which brand a business buyer elects to go with and provide a point of differentiation beyond that found in product features and benefits. Is your website content up to the task of setting your brand apart and getting business buyers to sign on the bottom line? If not, we can help. Reach out for a free, no-risk consultation and/or quote for website copywriting services that can get your business website found more often in online search and convert more buyers.